In mid-1942, Republic Aviation Corporation initiated a design study to lighten their P-47 Thunderbolt fighter for improved performance. 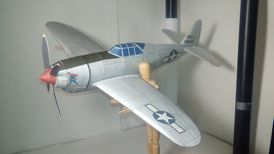 The Thunderbolt had been steadily gaining weight as the design matured, while comparative enemy aircraft, like the Focke-Wulf FW 190A, were much lighter. 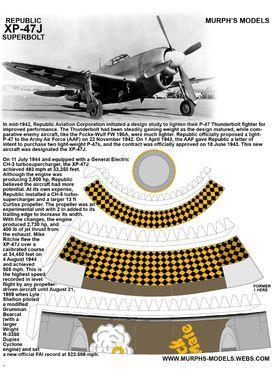 Republic officially proposed a light-P-47 to the Army Air Force (AAF) on 22 November 1942. 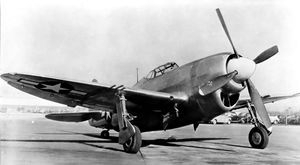 On 1 April 1943, the AAF gave Republic a letter of intent to purchase two light-weight P-47s, and the contract was officially approved on 18 June 1943. This new aircraft was designated the XP-47J. On 31 July 1943, Republic issued a report comparing the estimated performance of the XP-47J with the P&W R-4360-powered XP-72 that was under development. The report concluded that the Republic XP-72 had more potential and recommended resources be focused on that aircraft. In addition, 70% of the P-47 production line needed to be re-tooled in order to produce the P-47J. Republic called for the cancellation of the second XP-47J prototype but encouraged the completion and testing of the first prototype. 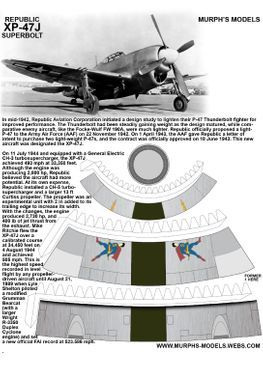 The AAF approved Republic’s plan and canceled the second XP-47J.